Please note that the installation of NodeXL requires use of Microsoft Windows™ (XP, Vista, 7, 8, 10) and Microsoft Office™ (2007, 2010, 2013, 2016). You can find further information about system requirements on the FAQ page. Download the NodeXL Pro Excel Template from the NodeXL Graph Gallery or NodeXL Basic Excel Template from Microsoft´s CodePlex website and then run it. If you are asked to accept the “Microsoft Visual Studio 2010 Tools for Office Runtime (x86 and x64)”, click the Accept button. When you are asked “Are you sure you want to install this customization?”, click the “Install” button. In the Windows Start menu or Start screen, search for “NodeXL”, then click “NodeXL Excel Template” in the search results or look for the desktop shortcut named NodeXL Excel template. You should see two folders: one named Data and another folder with a strange name, that is where the old NodeXL is stored. Please delete the folder with the strange name and try reinstalling NodeXL Pro. You will be able to read any workbooks you have created in older versions of NodeXL Basic. On some systems (often in large corporations or universities) access to websites needed by NodeXL are blocked. To resolve this issue, these web site addresses can be added to a list of trusted sites. NodeXL needs access to the NodeXLGraphGallery.org web site. 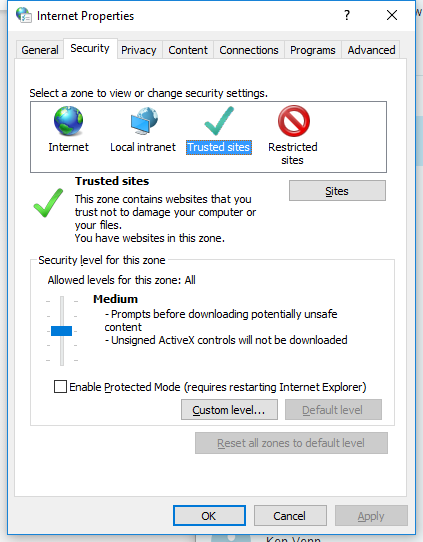 To enable access to this web site, from the Windows Start menu, search for “Internet Options” and then select “Security” and “Trusted Sites”. 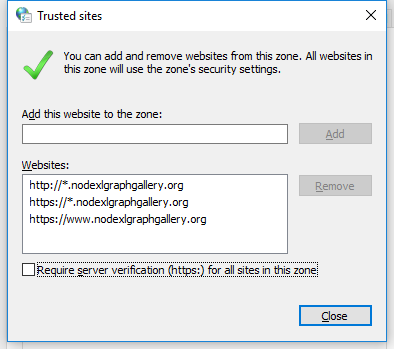 There is a button below the Trusted Sites menu: “Sites” – select this to add the NodeXLGraphGallery.org web site to the exception list. The Trusted Sites dialog will allow you to enter the following three web addresses. NOTE: It is necessary to UNCHECK “Require server verification (https:) for all sites in this zone”. From the email we sent you, download the attached file(s) containing your NodeXL Pro license(s) on a secure machine. (The file may currently be in your download directory). Do not unzip or run this file. It is not compressed. It is not a program. Copy a single one of these NodeXL Pro license files (each of these files have an extension of .lic) to the machine that is going to run a copy of NodeXL Pro. Paste the license file (.lic) in any location on the local system. You may place this file in any accessible directory. You may want to create a special folder to hold theNodeXL Pro license key file – this can be a good way to ensure the file is not moved or deleted. Open NodeXL Pro by searching for “NodeXL” from the START menu in Windows. If it is not visible in the Start menu, try Windows Start>All Apps>”N”>NodeXL Excel Template then right-click and select “Pin to Start Menu”. If NodeXL Pro has not been registered before, or if the NodeXL Pro license file has been moved or damaged, you will be asked to select the file. Use the Browse… option to open a file open dialog and navigate to the location of the license file that was sent to you. Then select OK. 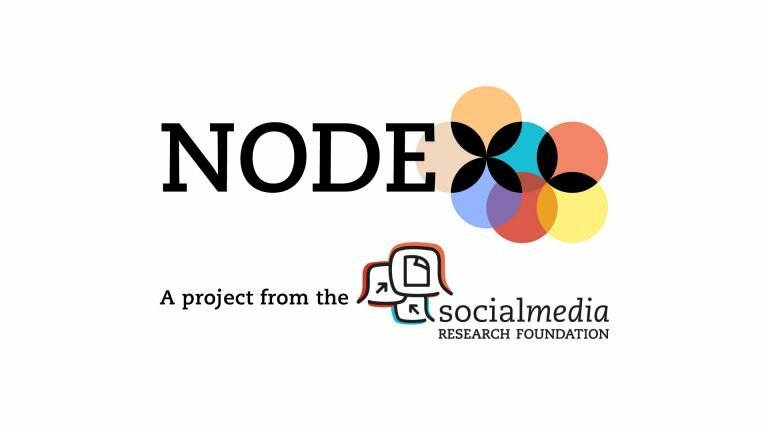 Your copy of NodeXL Pro is now licensed and should be operational! Enjoy!